2 week Commodores Cruise from Cromarty via Caledonia Canal to Tobermory and return..
2 week bare-boat charter in from Reggio Calabria to Aeolian Islands on 36 ft Beneteau (Stromboli, Volcano, Salina, Lipari, Ustica), and Sicilly. 2 week Commodores Cruise from Cromarty to Whitehills via Lossiemouth and Buckie. 2 week bare-boat charter in Turkey (Bodrum, Datca and Gokova gulf). Engine failure. Weekend sailing in Cromarty Firth. 2 week Commodores Cruise from Cromarty to Kirkwall via St Margarets Hope, Stromness and Pierowall. 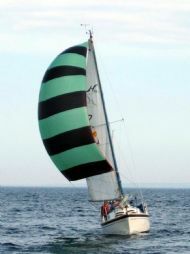 Whole Day Sailing experience with Blue Box Sailing on Volvo Open 60 yacht around the Island (Isle of Wight). Weekend cruise Gosport to Cherbourg, Beaulieu River, Cowes, return to Gosport on Mystery 35 (Aragorn). 2 week crewing on 37ft Prout Snowgoose Elite Catamaran from Rome to Corsica, Bonifacio, La Madelana, Lavezzia Island, return to Rome. Weekend cruise from Cromarty to Lossiemouth, Helmsdale and return to Cromarty. Purchased Red Ruth (December 2007). 2011 onwards - please see our pages on the main index to the left. More pictures on photo gallery page.